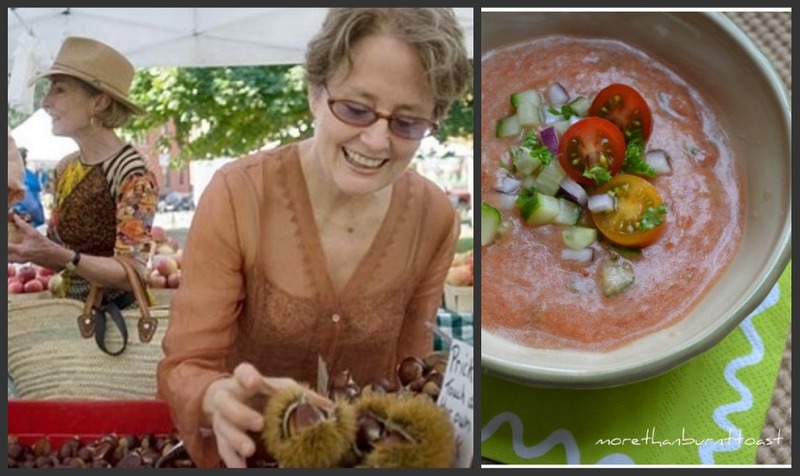 This is the second installment of an extraordinary culinary journey with Mary of One Perfect Bite who has invited bloggers to travel along on this gastronomic challenge . Gourmet Live brought out a list of the 50 most influential women in food...Fifty women game changers. Some are chefs, some are food writers, and some are women who are passionate about the creative process. For the next 50 weeks we will experiment with dishes from each of the 50 influential women on "the list". Whether you agree or disagree with the authors chosen fifty it will be an enjoyable and creative outlet to cook from the masters who have all influenced us in one way or another. Being a woman and passionate about food myself I wanted to explore and not only learn from the masters but recreate some of their dishes to better understand what has shaped and molded them into who they are today. All the while I have been researching each of their lives and different culinary styles and teaching this "old dog" a few new tricks. My cohorts for this adventure have been Joanne of Eats Well with Others , Claudia of A Seasonal Cook in Turkey and Taryn of Have Kitchen, Will Feed , and newcomer Susan of Spice Garden. If you would like to join in please contact Mary. This is an informal event and you have the flexibility to follow along when you can. She will be posting every Friday. It is always interesting to see how vastly different all of our chosen dishes are!!!! When it comes to food, Alice Waters is a legend. At age 65, she has done more to change how we eat, cook and think about food worldwide than anyone since Julia Child. She's hailed by the world as one of the greatest cooks, inventing Californian cuisine and turning the gastronomic world on to organic food. More than any other single figure, she encouraged us to be adventurous and improvise with the finest ingredients you can get your hands on, with her simple and straightforward approach to their preparation. "Organic is not just a great adjective to describe the fruits of Alice Walters' cooking; it describes her way of life - simple, healthful, and close to nature. The Head Chef at Berkeley's Chez Panisse cultivates her passion for only the freshest of ingredients, insisting on only those tasty things made, baked, or harvested locally. Heck, you might even order something plucked straight from her own personal garden! Food doesn't get fresher, tastier, or healthier than that..."
Alice was only 27 years old in 1971 when she opened her French bistro Chez Panisse in Berkeley, California. Each time I go to San Francisco it has been on my list to travel to her iconic restaurant, but maybe next time....sigh. She's famous as the mother of the "slow food" movement that preaches about fresh food grown in a way that's good for the environment and is a healthy alternative to "fast food." With dishes like whole baked garlic with white cheese and peasant bread, smoked trout and chervil butter, and ragout of wild mushrooms with veal stock and red wine, Alice helped change our palates, inspiring a devotion to seasonal cooking and local organic ingredients that we have all adopted and made our own. With 8 cookbooks under her belt where would I begin? My first thought was to slow roast Alice's chicken, which is rubbed with a savoury paste of olive oil, garlic and herbs before roasting and then served, as recommended, with a few slices of baguette drizzled with olive oil, toasted in a low oven and then rubbed with a clove of garlic; or served on some simple greens, with a shallot vinaigrette and some of the defatted pan juices poured overtop....whew, if that isn't a run on sentence!!!! But with temperatures breaking all records during the summer months I opted for this traditional Gazpacho, an iconic chilled summer soup; refreshing and acidic and featuring my best friend "The Tomato" at its seasonal peak. Many non-traditional ingredients find their way into modern recipes for gazpacho such as avocado or my personal favourite... watermelon. These are delicious in their own way. However, the original recipe from Spain is pretty simple, featuring olive oil, tomatoes, bread, garlic, and garnishes. The bread is what's usually missing from today's recipes. Like eating Caesar Salad with your hands this is a technique I wanted to explore!!!! Like a good Italian Pappa Al Pomodoro it thickens the soup and makes use of what would otherwise be wasted and served to the birds that flock outside your door. In Alice Waters' recipe in The Art of Simple Food, she soaks it briefly in water, then mashes it with garlic into a paste along with a soaked dried ancho chile to give a "tickle of heat". How does it taste...this "liquid salad" is pretty much summer incarnate. The flavour improves with age so allow it to marry overnight in the fridge. All good things come to those who wait. Claudia of Seasonal Cook in Turkey - a new grandaughter in the family keeps her busy this week. Welcome to the world little one! 1. In a mortar and pestle, pound the reconstituted ancho chile into a paste, then scrape out and set aside. Add the garlic and a pinch of salt to the mortar and pound into a paste. Soak the bread in cold water for 2 minutes, then squeeze out the water and add that to the garlic. Mash it all together until smooth. (Alternatively, you could do it in a food processor). 2. Grate the cut sides of the tomatoes on the medium holes of a box grater into a large bowl until only the skins are left; discard the skins. Stir in the bread paste and add the chile puree to taste (this allows you to control the spiciness). Add 1/4 cup of olive oil and salt to taste, then chill in the refrigerator. 3. In the meantime, mix together the remaining ingredients to create a relish. Divide the soup among bowls and top each with a generous spoonful of relish. It's amazing what one person can do to change the world isn't it. I've often wondered where "eat fresh and local" would be without Alice. We love gazpacho too Val and I really like your idea of watermelon. Sounds so refreshing. That is a lovely summer dish! Your gazpacho looks delicious. Fantastic post and what a great series you are all doing! This looks amazing. I've never tried making gazpacho with bread before, but I think this will be my go-to dinner in the New York heat! Gazpacho is one of my absolute favorite summertime dishes! Love this interesting take on it. I've never added bread to mine before, but may have to give it a try. Gazpacho sounds, smells, and tastes of Sumertime! the concept sounds really interesting... I may contact Mary... but I do loath Gazpacho so much!... sorry! I walked by Chez Panisse while I was in SF...does that count? This gazpacho sounds delicious! I've never actually had one before that I can recall but i bet it would be so refreshing after a sweaty long run! Wow, that's quite a journey! And gazpacho is always a great way to start such an amazing culinary trip. Hmmm delicious! Wow...with 5-1/2 lbs. of tomatoes, you'll be having gazpacho all week. You know I bet it freezes well. I've never tried to freeze it, but I think I will next time. Have you? I love jumping back and forth between your blog and Mary's blog. I'm liking this series a lot, Val. Alice Waters is wonderful..I love her cookbooks. Seems I remember reading about her in one of Tony Bourdain's books....he wasn't terribly kind, but then he isn't noted for being particularly nice, is he? In all honesty, I'm not a cold soup kind of girl, but that being said, this looks fabulous. It has "taste of summer" written all over it. What a great challenge. I read the list and thought about it quite a bit. Good for Barbara. And you. I could never do something like this for 50 weeks. But, I will enjoy reading about it. Do you have a Slow Food Convivium where you live? You should find out. We have the third largest group (convivium - from convivial) in Canada, right here in Edmonton. I am very involved- and actually passionate about it. Myra Jernigan (who is the gal with the Cooking School on Salt Spring Island that I still want us to go to in September) is the President of Slow Food Canada. I have eaten at Chez Panisse and it is almost a spiritual experience. My daughter ordered a diet coke. Of course, they don't carry anything of the kind being a healthy restaurant with daily harvests of good, clean and fair local food. The waiter was so gracious and took quite a bit of time explaining to her why she shouldn't drink that. :) The meal was one of the best we have every had. I would love to eat in her kitchen like Leslie Stahl did. I think she is on the list due to her political voice regarding food sovereignty more than her own ability to cook... but I came home after eating there and made her brick fired chicken. She is an incredible woman. No doubt about it. I follow her on Twitter and love her little quips. PS - AND she is a school garden guru - I have her book on that - and interestingly enough, I just posted a little diatribe about the importance of school gardens a few hours ago! i love the series ur doing. always into something new, chica! 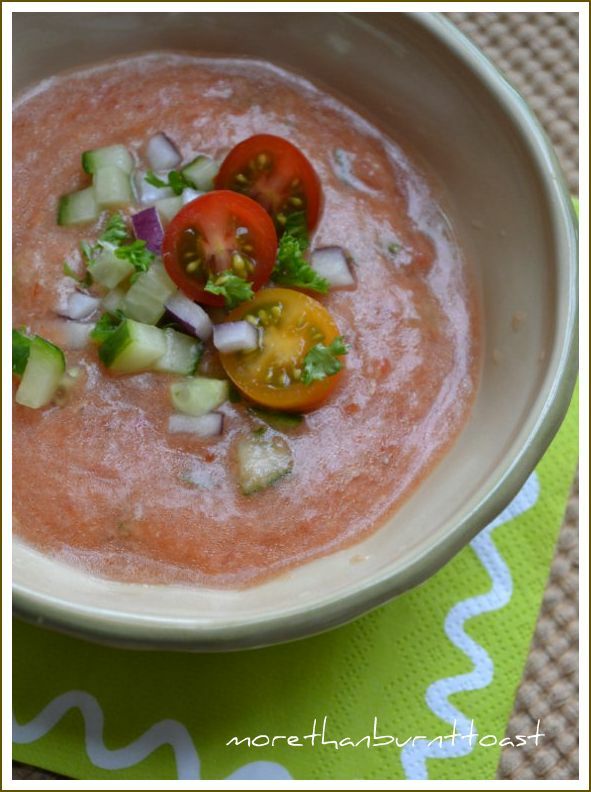 I'm a huge fan of gazpacho's and working on a watermelon now to feature on the blog. should be up in a week or so... but this Waters' one looks so perfect! I love all of the fresh veggies on top! 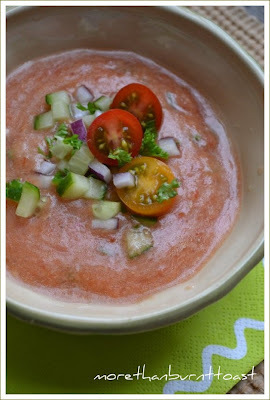 Woo hoo - yuor post has just reminded me tha it is tomato time and therefore gazpacho season! My mouth is watering juts thinking about this perfect example. The gazpacho will freeze well. This is my favorite. I will be posting Ajoblanco soon....a must try.